UNITED NATIONS (AP) — This was no normal diplomatic speech. 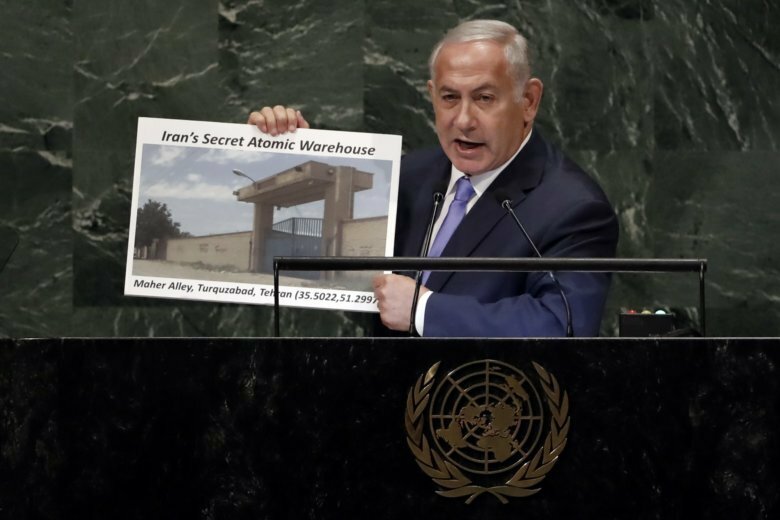 Israeli Prime Minister Benjamin Netanyahu held the U.N. General Assembly in suspense Thursday — and flashed boldly printed props — as he accused Iran of hiding a clandestine nuclear warehouse in a rug-cleaning plant. In case anyone in the hall hadn’t already been paying attention, he took the unusual step of brandishing visual aids — a poster-board map, then a poster-board photo, then another poster-board map. It wasn’t his first time. Netanyahu is known for its showmanship at the U.N. General Assembly. In 2012, he famously held up a poster-board of a cartoon bomb while discussing Iran’s nuclear program. “Where should the red line be drawn? A red line should be drawn right here,” Netanyahu said during his presentation, his marker squeaking across the poster. Netanyahu vigorously opposes a 2015 deal curbing Iran’s nuclear program in exchange for a lifting of sanctions. Iran denies pursuing nuclear weapons. President Donald Trump pulled the U.S. out of the agreement in May.